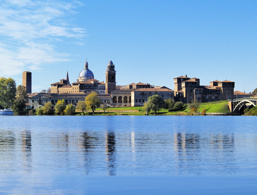 Holidays in Mantova ↔ Discover Lake Garda! 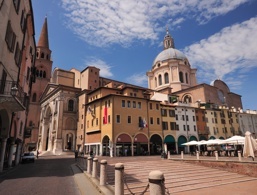 The charming old town has many museums, historic buildings and great restaurants to offer. 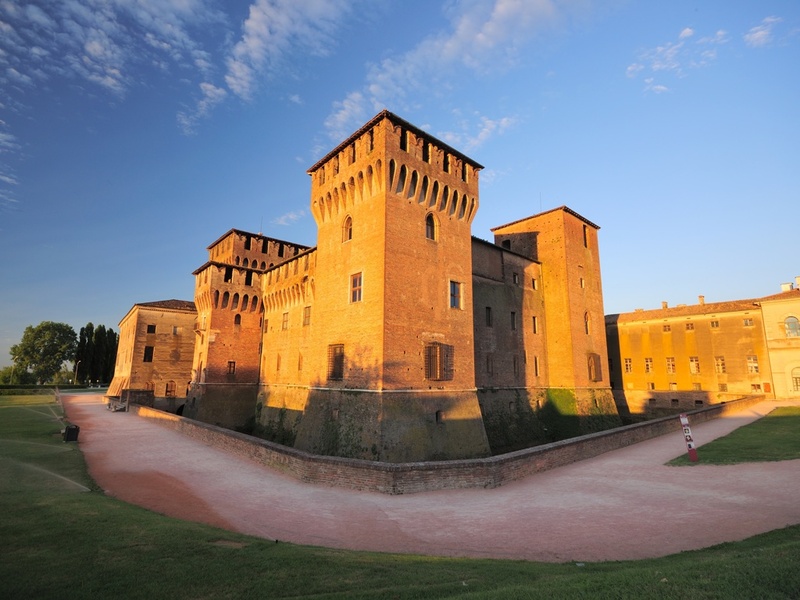 The Lombard province of Mantova is just a few kilometres from the coast of Lake Garda. It is a lively centre that offers just as much for art and culture lovers as it does for outdoor enthusiasts and foodies. In the province of Mantova, where the town of the same name is located, architectural works of art, monuments, cultural and artistic events, a beautiful natural landscape and a multitude of exciting culinary events meet, making the area an appealing holiday destination. 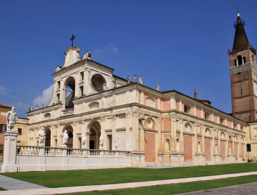 The churches, palaces and historical buildings of Mantova tell of an eventful history with protagonists such as the ruling families Bonacolsi and Gonzaga or Mathilde of Canossa (also known as Tuszien). 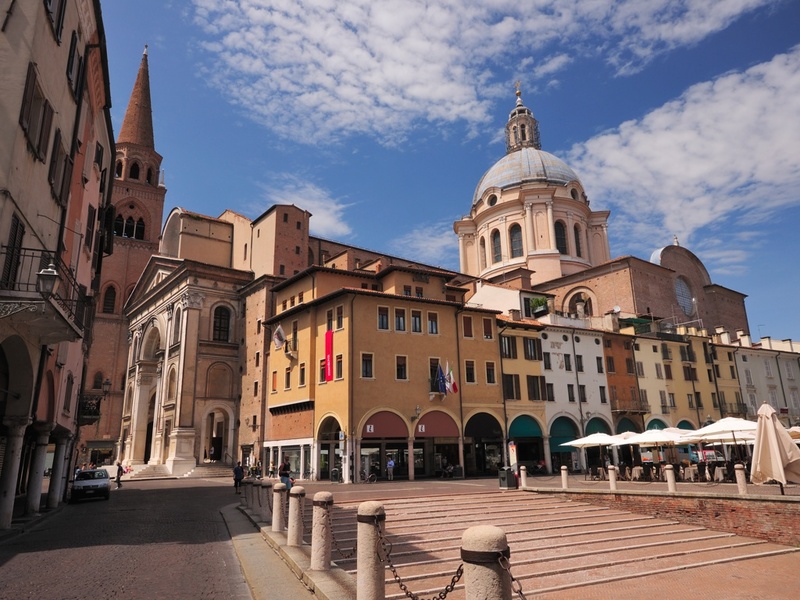 The city is rightly considered one of the most important centres of the European Renaissance and is part of the UNESCO World Heritage. 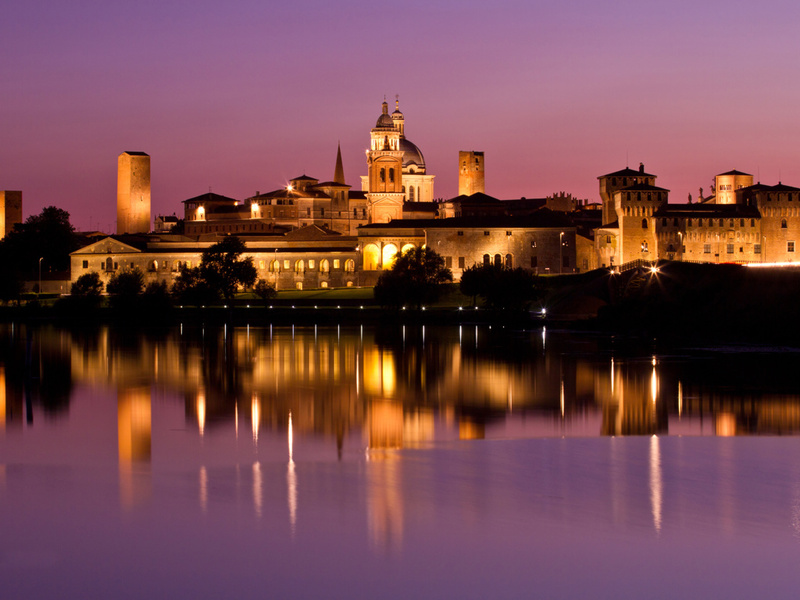 Mantova is surrounded on three sides by water from the Mincio River. To defend the city, an engineer developed a complex system in the 12th century to encompass the city with canals and dams on all four sides with water. This took the form of four lakes called Superiore (the upper one), the Mezzo (the middle one), Inferiore (the lower one) and Paiolo (cauldron). Over the years, Lake Paiolo was drained as a result of floods, so that today the city is surrounded by only the three remaining lakes. 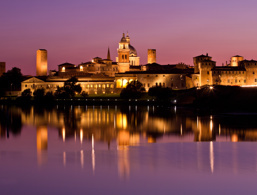 Mantova is a popular destination for those who are interested in art and history. 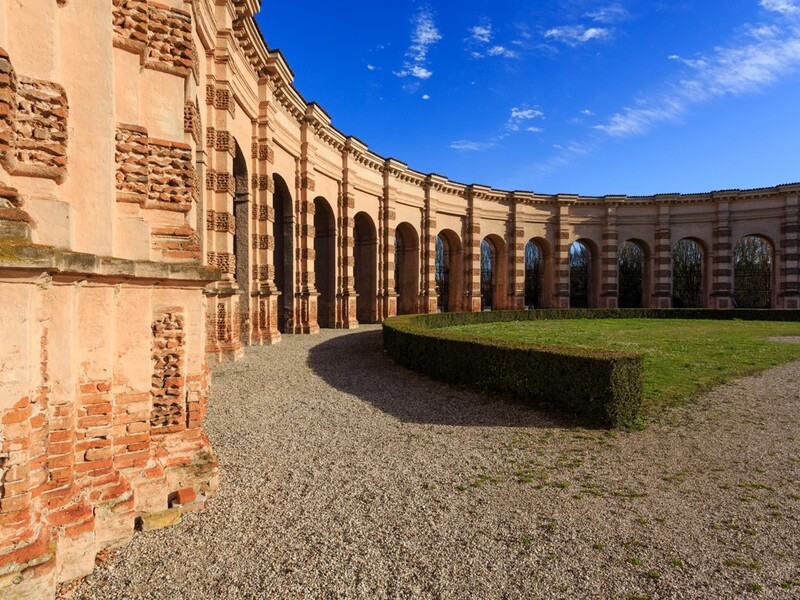 The renaissance has clearly left its mark here, and anyone visiting one of the many churches or historical buildings will feel transported back to the time of Gonzaga's reign. 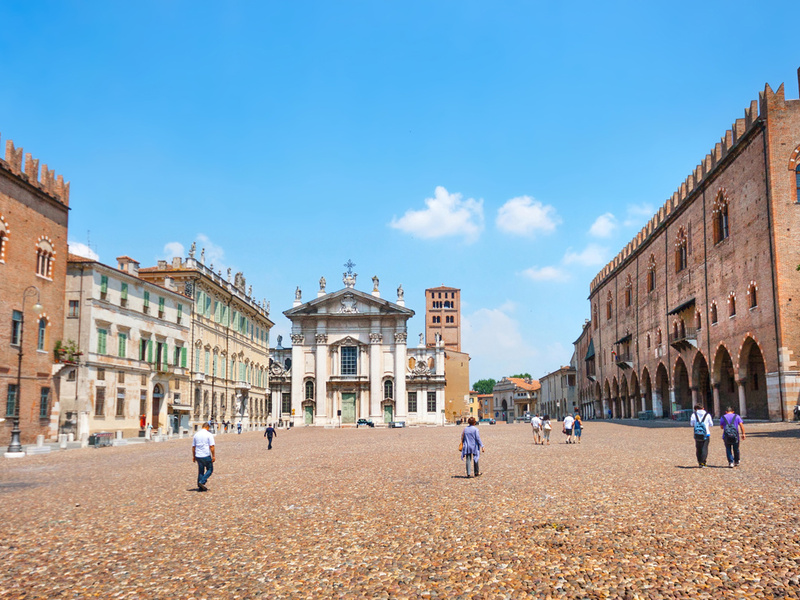 Another highlight of Mantova is in Piazza Sordello where you'll find the house of Rigoletto. He was once the court jester of the Gonzaga family and is best known for his opera, of the same name, by Giuseppe Verdi. The 15th-century building can be visited. In the small courtyard is a sculpture of the artist Aldo Falchi, which represents Rigoletto. 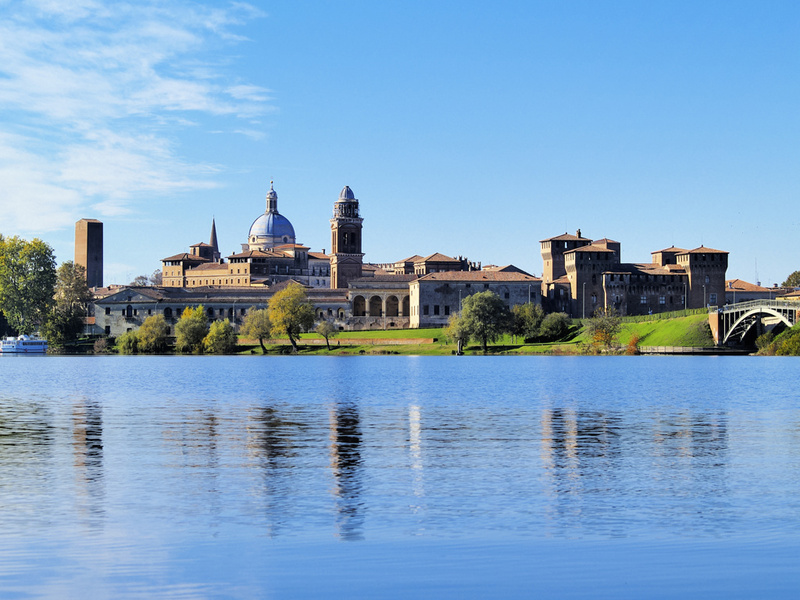 Discover the picturesque city of Mantova next to Lake Garda. 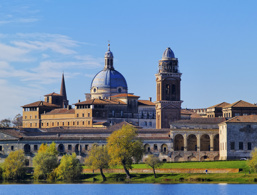 The Cathedral of Mantova is dedicated to Saint Peter and was built in Romanesque style between 1395 and 1401, but also has Gothic elements. Previously, there was an early Christian temple in its place, which was destroyed in a fire. 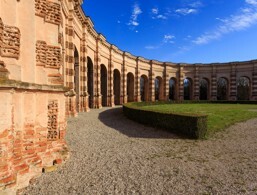 In 1545 the cathedral was converted by Giulio Romano. The current marble façade of Carrara dates back to 1761. Inside, a coffered ceiling dominates over the three naves. In the central nave, there are some saints statues from the 16th century. Above the main altar, the remains of Saint Anselm of Baggio, patron saint of the city of Mantova, are kept. The circular church of San Lorenzo was built in the 12th century under the rule of the Canossa family, making it the oldest church in the city. The circular building, located in Piazza delle Erbe, is adorned with frescoes by the Byzantine school dating back to the 12th and 13th centuries. After being desecrated for a time, the round church of San Lorenzo was restored in 1911 and finally reused for religious purposes in 1926. 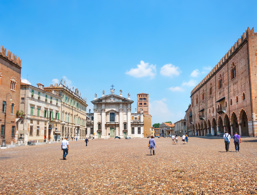 Mantova's Palazzo Ducale is an architectural complex made up of various buildings connected by galleries, corridors, courtyards and extensive gardens. 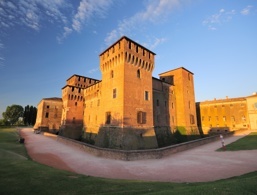 The palace was once owned by the Gonzaga family and is now the second largest in Europe after that in the Vatican. 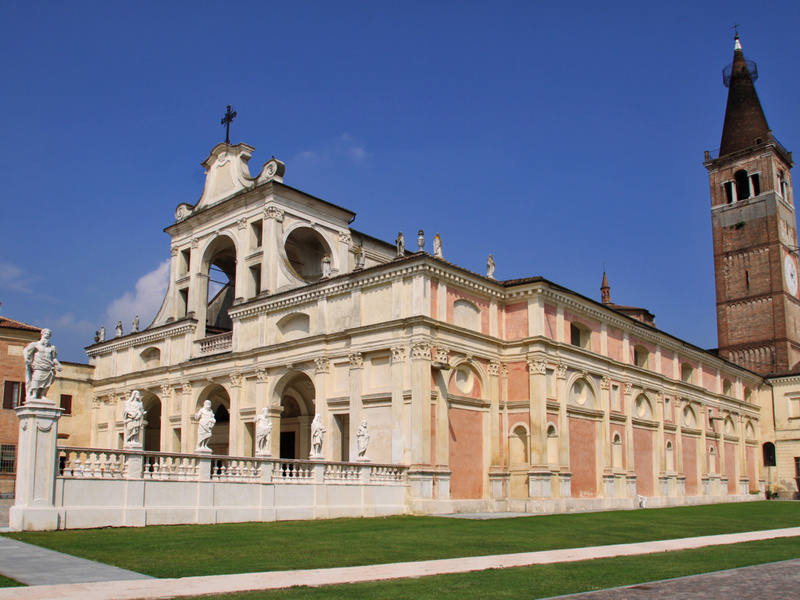 The Palazzo Te was built in 1525 by the painter and master builder Giulio Romano on behalf of Marquis Federico II Gonzaga. It is said that the palace, which used to be on an island full of trees in a now drained lake, was the residence of the Margrave's lover, Isabella Boschetti. The interior of the palace is decorated all over with well-preserved frescoes. These include the famous Sala dei Giganti, the Sala di Psiche and the Sala dei Cavalli, a hall painted in honour of Gonzaga's horses.